Mark Deutschmann plans to replicate his clever construction trick — importing condo units manufactured in another state — for two more developments he is pursuing immediately south of downtown Nashville. Deutschmann, who’s built his reputation by revitalizing a number of urban Nashville neighborhoods, expects to buy prefabricated (or, prefab) condo units for a pair of projects near The Fairgrounds Nashville. As we’ve written, that area of Nolensville Pike, the most vibrant international district in the city, is poised for a jolt of real estate investment. At the fairgrounds site, Metro plans to build a $250 million Major League Soccer stadium that would open in 2021. Deutschmann’s Core Development Services used the technique for its recently finished Alloy on Tech Hill project near the fairgrounds. The 100-unit condo complex at 370 Herron Drive also features the new roasting operations of local coffee brand Bongo Java. Core Development ordered modular condo units built in Pennsylvania factories. The units arrived with flooring, light fixtures, windows, shower doors and cabinets already installed. 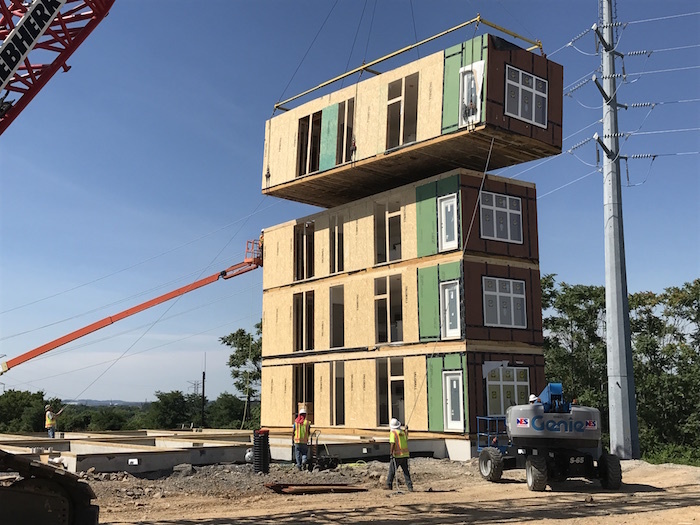 Installation took three weeks, as opposed to the five months it would have taken if the units were built from scratch on-site, said Kent Campbell, vice president of Core Development.